Why would you go on a yoga retreat? As foods we eat are our gross nutrition the herbs and spices are the micro-nutrition. Both work in synergy to create a balanced diet. My grandmother always had common remedies access right from her kitchen cabinet. I grew up absorbing what she extruded in simple ways. As I grew up it had deep impact on my day to day life. Now as an Alternative Medicine Ayurveda Practitioner I have amalgamated my childhood learning in abstract with my know how of the herbs thru the practice into a boon of everyday learning experientially. Asafoetida: a resin-gum from root; it is pungent in taste with heating effect and pungent in post digestive effects, it is use to reduce the flatulence causing properties in foods especially beans & lentils, good to eliminate worms from body, used in low doses due to its aromatic nature, it cleans stagnation in digestive tract by improving the intestinal flora and strengthen digestive fire, mixed in warm oil and administered into the belly button can calm a colic attack in children as well as in adults. Cumin seeds: cooling because it is bitter and pungent, but it is carminative alterative and stimulant for digestion Aids Digestion. Thymol, a compound in cumin, is known to stimulate the glands that secrete acids, bile and enzymes, Boosts Immune System. Treats Respiratory Disorders, Promotes Skin Health, Treats Insomnia, Prevents Diabetes, Has Antiviral and Antibacterial Properties & High Source of Iron. Green cardamom: is aromatic, pungent & sweet, cooling in effect and sweet in post digestive taste and can Use it to combat nausea, acidity, bloating, gas, heartburn, loss of appetite, constipation, and much more. This spice helps the body eliminate waste through the kidneys. It is used as a breath freshener and has natural blood thinning quality. Coriander seeds; fruit part of the plant, it is diuretic, diaphoretic, carminative and stimulant, good for burning urethra, sore throat, urinary tract infections, indigestion, good as anti-inflammatory , it improves digestion and absorption, it can be used together with cumin & fennel seeds for synergy effect on digestive system. Dill seeds or Caraway seeds: it is pungent and bitter in taste, cooling in effect with pungent post digestive taste, it is used as a carminative spice, alternative (restores normal health) and expectorant (eliminates mucus) May Help Reduce Menstrual Cramps, Helps Reduce Depression, Lowers Cholesterol, Act as a Natural Bug Repellent, Provides a Source of Energy and Aids in Digestion through Beneficial Fatty Acids, Contains Antimicrobial Effects, Protects Against Free Radicals. The famous formulation of gripe water key ingredient is Dill seeds. Curcuma fresh or powder: generally known as Turmeric; it is root of the plant, bitter astringent and pungent in taste, heating to body and pungent in post digestive state therefore used in small quantities only, it is antibacterial, antifungal, stimulant and carminative, used in poor circulation conditions, arthritis, anemia, wound healing and sore muscles, it is mother nature’s antibiotic that improves intestinal flora. Its energy is of Divine mother and sattvic in nature, promotes digestion of protein. A powerful tonic for skin conditions like acne & eczema. Fenugreek seeds: fruits of the plant both green leaves and seeds are used in cooking , it is bitter, pungent & sweet in taste, heating in effect and pungent in post digestive effect , it is used as stimulant, tonic, diuretic, expectorant and aphrodisiac, used in chronic cough, allergies, bronchitis, toothache , sciatica and arthritis. Do not use in pregnancy but post -delivery it is good to have as it promotes vaginal bleeding and promotes breast milk. It is good as liver cleanse, and good for hair growth. Ginger fresh & powder : the root is used it is pungent & sweet in taste, heating in effect and sweet is post digestive taste making it tridoshic in its benefits to all Dosha types be it VATA, Pitta or Kapha types, it works on digestion and respiratory systems, excellent sattvic spice and is considered as “ vishwabheshak” the universal medicine among all spices, dry ginger powder is stronger than its fresh forms, good anti-inflammatory agent in arthritis , relieves gas and bloating including menstruation cramps, good for heart, topically its paste in water can relieve pain and headache. Hence making use of the spices and herbs as your first aid will not only benefit you to heal but prevent many common ailments. More you learn more you can benefit from them. Nature is ample rich in its power to maintain our balance in the body, mind and spirit. Hope this helps you to begin a new learning this is just the tip of the iceberg. Be creative and explore more into the world of micro-nutrition. As you explore you can add to this primary list of spices and herbs and build your own cabinet full of ancient wisdom ready for you as your foremost place to go for healing. 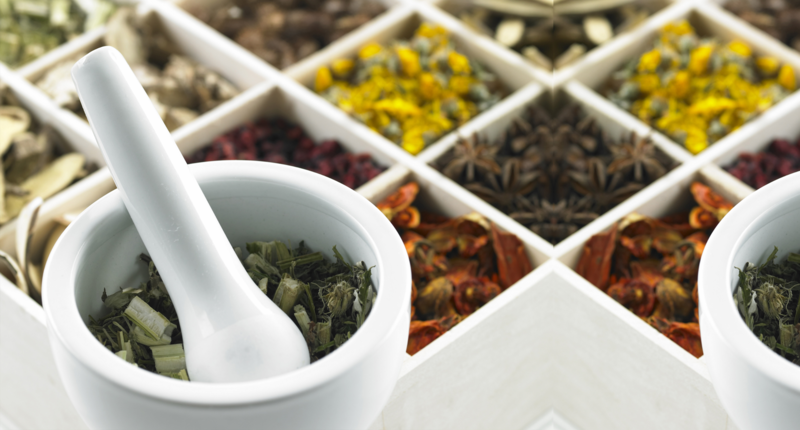 Author of Ayurveda to the Rescue: An Ancient Remedy for Modern Ailments. 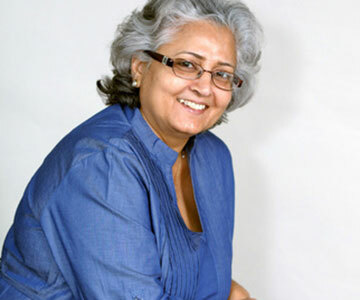 She teaches and practices Ayurveda with a specialty in Ayurvedic nutrition. OM Healing Center offers daily Hatha and Ashtanga Yoga Classes, private yoga classes, meditation, yoga teacher training, a combination of Yoga and touristic trip to incredible India, themed weekly retreats. 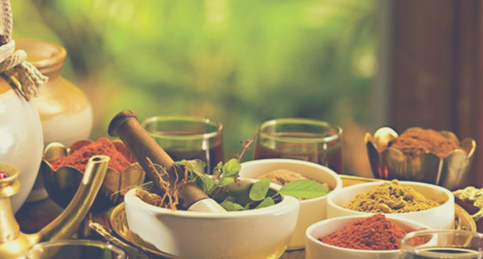 As part of our alternative medicine, we offer a holistic approach to health through Homeopathy, Quantum Healing, Ayurveda Medicine, Ancestral Medicine, Ayurveda Massage, and Cranial massage, Reiki Energy Healing, Nutritional Coaching and Psychotherapy.